I must declare an interest here. I’ve stayed in the Randolph and I was far from impressed by the hotel. I haven’t been in there for a few years but one particular feature of the place really did my brain in: the Morse Bar. In general, avoid any bar in Oxford with pics of Morse or his sidekick, Lewis. The bar is, as you’d expect from a place like this, not the cheapest place on the block, but what’s really irritating is that the place is dotted with pictures of John Thaw, who played the egregious Wagner loving detective in the long running TV series. Nothing against John Thaw – a fab actor and veteran, for example, of The Sweeney – but y’now. 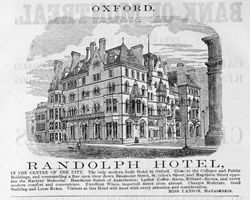 The Randolph, in my opinion, peddles a “vision” of Oxford which is bogus. Yes, it isn’t too far from the railway station and even closer to Gloucester Green bus station. When I stayed there, it was in a tiny room way up in the building. The service was indifferent and its so-called renowned “Morse Bar” deserves to be consigned to the trash can of old repeated TV stories. For some reason, neither Morse nor Lewis were ever filmed in Blackberry Leys or Barton. Expect to pay £200+ for a double room for two adults, and expect to pay £15 for a breakfast, although if you scuttle out of the hotel, skipping the breakfast, you can go to the St Giles café, just a little way away, and get a wonderful breakfast for half the price. If you’ve got a car, expect to pay £30 a night to have it parked on site. This entry was posted in Places to Stay and tagged All About Oxford, Ashmolean, Barton, beaumont street, Blackberry Leys, gloucester green, Inspector Lewis, Inspector Morse, King John I, Mike Magee, Morse Bar, Oxford, Richard the Lionheart, St Giles Cafe, the randolph hotel, the sweeney. Bookmark the permalink.